Tomorrow's aircraft could contribute to their power needs by harnessing energy from the wheel rotation of their landing gear to generate electricity. They could use this to power their taxiing to and from airport buildings, reducing the need to use their jet engines. This would save on aviation fuel, cut emissions and reduce noise pollution at airports. The feasibility of this has been confirmed by a team of engineers from the University of Lincoln with funding from the Engineering and Physical Sciences Research Council (EPSRC). This forms part of the Research Councils UK Energy Programme. 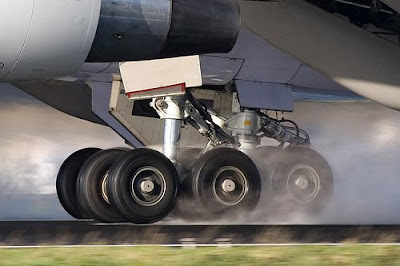 "Taxiing is a highly fuel-inefficient part of any trip by plane with emissions and noise pollution caused by jet engines being a huge issue for airports all over the world," says Professor Paul Stewart, who led the research. "When an Airbus 320 lands, for example, a combination of its weight and speed gives it around three megawatts peak available power," Professor Stewart explains. "We explored a wide variety of ways of harnessing that energy, such as generating electricity from the interaction between copper coils embedded in the runway and magnets attached to the underside of the aircraft, and then feeding the power produced into the local electricity grid."